Home Reviews Album Reviews Old 97’s and Waylon Jennings: E.P. Old 97’s and Waylon Jennings: E.P. Those late to the Record Store Day game of limited edition releases, or who don’t own a turntable, are now in luck. The vinyl 4 track, double 7” EP of the Old 97’s and Jennings recorded back in 1996 is finally available on CD. Better still, it comes with two more previously unreleased cuts, rare 97’s demos from the same year, added to sweeten the deal. 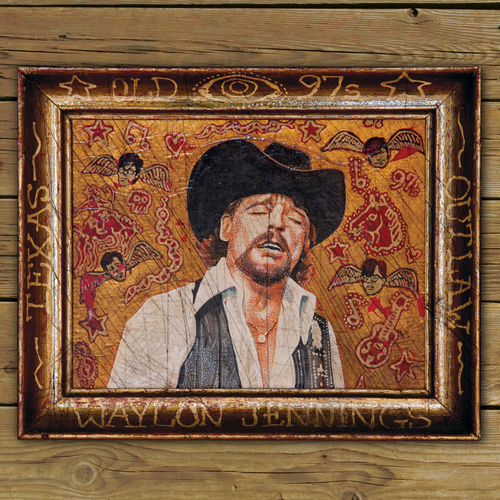 Apparently Jennings, who was in poor health at the time, objected to the cover art of a drawing of the members of the Old 97’s, with angel wings sprouting from their heads, circling a large center painting of Jennings. Hence, the music stayed locked away until Jennings’ son Shooter approved the limited release vinyl package for April 2013’s Record Store Day. Musically, the combination sounds rugged and inspired, especially because lyrically the songs, both Old 97’s originals, deal with impending death. “Iron Road” tells the story of an old railroad worker looking back on his life with a Johnny Cash-styled feel, while the ballad oriented “The Other Shoe” refers to waiting for the inevitability of life’s end. If Jennings was comfortable singing these songs, it’s strange that the cover art would be an issue, but it’s wonderful to hear this creative collaboration, even 17 years after it was recorded. The other four tracks are raw acoustic demos that ended up on various future Old 97’s or frontman Rhett Miller solo projects and that diehard band fans will appreciate. But the riveting Jennings performances are worth the price of admission and leave you wondering what would have resulted if the collaboration could have flowered into a full album.